We have developed CS Batch 3000, a suite of batch control software applications for implementation of recipe management and process management for the CENTUM CS 3000. CS Batch 3000 manages and controls batch production process by coordinating the use of plant equipment, formula data, and procedural logic to produce products. CS Batch 3000 conforms to IEC/61512-1, an international standard of batch control. This paper outlines CS Batch 3000. Recently, manufacturing industries are trying to slash the total cost of ownership (TCO). Batch processes are not exceptions. Until recently, in comparison to continuous processes, batch processes have generally not yet undergone systematization and standardization. The attention of the public has been drawn to batch processes because a batch process provides an agile production method that can promptly adapt to the changes in market needs and new requirements. Nevertheless, batch processes are so diversified that many problems need to be solved in order to create an efficient system. Furthermore, adaptability to an open environment is also required. To meet these demands we drew on many years of expertise gained from configuring a great number of control systems for batch processes to develop the CS Batch 3000 batch control package, which conforms to the international standard, IEC/61512-1. ISA/SP88, NAMUR, and IEC TC65 are well-known international workgroups that discuss and research batch control systems and the standardization of batch control is being promoted by and information is being exchanged between the World Batch Forum, European Batch Forum, and Japan Batch Forum. CS Batch 3000 conforms to IEC/61512-1, which defines the standard of the terminology and models of batch control that were previously defined by ISA/S88.01. The employment of an IBM PC/AT-compatible computer running the platform Windows NT for operation and monitoring functions and engineering functions for recipe generation offers high costs performance. 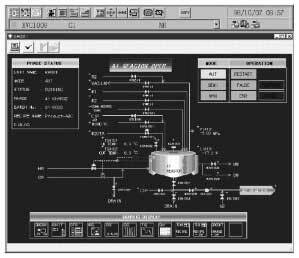 While, for batch control and unit control, high system reliability is guaranteed by using Yokogawa's original hardware, which incorporates leading-edge technology. 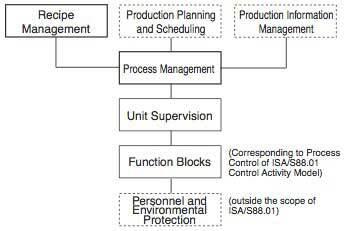 ISA/S88.01 defines seven activities in the control activity model. In accordance with these seven activities, CS Batch 3000 provides the two activities enclosed by thick lines in Figure 1. Controlling a batch process involves the control of two different aspects: control of each equipment unit and control of each batch (of products to be produced). When producing a single brand of products, management of batches is rarely needed. Recipe management provides functions to generate and edit master recipes. Process management provides functions to create control recipes based on specified master recipes, and perform management of batch executions based on the control recipes. Unit supervision implements control of each equipment unit (simply referred to as 'unit'), such as a reactor, by controlling equipment modules and control modules. Sequences and batches are executed in field control stations (FCSs) since they require high reliability, thus allowing the sequence control to be completed in the event that the computer fails. Recipe management is composed of functions to categorize recipes into groups, and generate, edit, save, and load master recipes to process management. To maintain the security and independence of these functions, the software of recipe management is made as independent of the system generation functions as possible. Header: contains the basic information for recipe management, such as the recipe name, comment, version, and author. Procedure: Graphically defines the procedure to produce the product in the form of a sequential function chart (SFC). Formula: Parameter values such as control settings for producing the product. Equipment Requirements: Defines the requirements of equipment for producing the product, such as equipment units to be used. Each recipe procedure is an ordered set of unit procedures, each of which is an ordered set of operations. 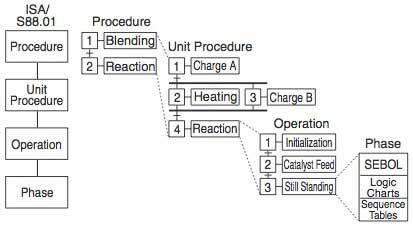 Recipe Procedure: Defines the order of execution of unit procedures graphically. Unit Procedure: Defines the sequential procedure to be completed within a particular unit by specifying the order of execution of sequences called operations in the form of SFC. One merit of recipe management and process management is that the order of operations can be modified by altering the unit procedures and/or recipe procedure for each recipe. Recipe procedures and unit procedures are generated using recipe management. Operations and phases are generated using the unit supervision. Thus hierarchically defined sequential procedures facilitate modification of the sequential order, reuse of operations and unit procedures, and concurrent engineering, as well as leading to drastic improvement of efficiency. Figure 3 illustrates an example of procedure structures. The Recipe View window of CS Batch 3000 displays a tree of hierarchically structured recipes in the left pane, similar to the way Windows NT Explorer displays folders and files, so the user can find and select the desired object (recipe) at ease. 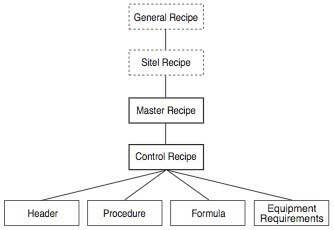 Recipe View is the start of generating and modifying the header, procedure, formula, and equipment requirements of each master recipe, as shown in Figure 4. Process management performs execution control of batch production, including the monitoring of recipe statuses, supervision of individual batches by using batch IDs and the acquisition of batch results and batch-related messages. Process management performs these activities based on each control recipe that is converted from a master recipe, and defines parameter values and other information required to produce a batch. Operation and monitoring windows of an HIS display the hierarchical structure of process cells, control modules, and equipment modules consistently. In the same manner, control recipes for individual batches can be classified into groups so that process operation can be done in two different ways: operation of each equipment unit and operation of each batch. The window for monitoring each batch can also be opened from a hierarchical tree view of batches in each group. This tree view is not only used to retrieve a window for the monitoring of a batch, but also indicates the status of each control recipe by changing the color of the icon. In CS Batch 3000, dynamically changing batch IDs are handled as batch ID objects which can be exchanged with one another over windows to display alarm and graphic windows for a specified batch. Batch ID objects allow the monitoring of each equipment unit as well as monitoring of each batch. Figure 5 shows examples of operation and monitoring windows. The batch report function acquires data and messages recorded during the execution of each batch and prints them out. The user can freely create reports using Microsoft Excel. 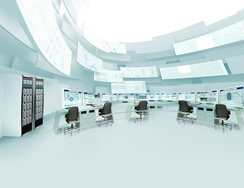 In addition to the data that should be acquired during the execution of each batch, such as process data, setting data, quality data, and manually entered data, process management sorts alarm event messages and operation records with the user names by batch ID and outputs them for each batch ID. Engineering, operation, and monitoring can be done in respect of each unit, such as a reactor. Procedural sequences can be coded hierarchically in SFC. Independent of the control in each sequential phase, interruption sequences such as an emergency stop and a monitoring sequence can be coded in SFC. The user can advance the sequence from one phase to another on an SFC. Unit procedures are carried out in an FCS, thus assuring high reliability of unit control. Figure 6 shows examples of operation and monitoring windows. Unit supervision is not merely used together with process management for control of the batch process but is also applicable to the continuous process. Unit supervision is included in the basic control functions of the CENTUM CS 3000 to facilitate the buildup of a system. The virtual test function using FCS simulators covers unit supervision and process management. Just with a notebook PC, all engineering from the generation of recipes to the debugging of batch control can be performed. CS Batch 3000 has an open and standardized interface, thus allowing other systems to be easily connected for future expansions and for flexibly configuring an overall system of Enterprise Technology Solutions. 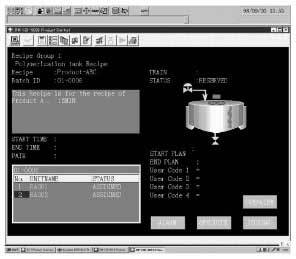 Exanalp II, a Yokogawa software product, performs production planing and scheduling, and CS Batch 3000 provides interface to production planing and scheduling. 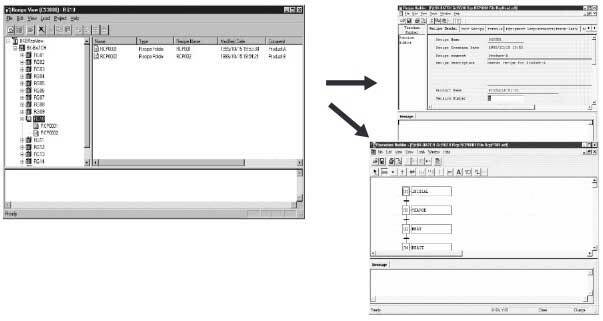 (See Figure 1) Also, production information management can easily be connected to CS Batch 3000 via interfaces based on the technology of OLE and DCOM3. The aforementioned batch report function is implemented by using these interfaces. We are considering the development of a product compliant to the specification of recipes that is currently being considered for standardization by SP88. This paper introduced the CS Batch 3000 batch control package and focused on its recipe management and process management. CS Batch 3000 is designed to allow the user to configure, start up, and operate batch control with high flexibility and expandability while maintaining excellent reliability. Activities to standardize a specification require a great deal of energy. Activities to implement SP88 standardization are carried out not only by volunteers, but also by companies as part of their business. Participation in standardization workgroups strength- ens the competitiveness of a company. We are committed to con- tributing to the furthering of the standardization of batch control and together with our users aim to continue with the development of batch control functions. Acronym for Distributed Component Object Model; the version of Microsoft's Component Object Model (COM) specification that stipulates how components communicate over Windows-based networks. Product and company names appearing in this report are trademarks or registered trademarks of respective holders.